Inclusive design: As designers, our decisions can empower or disable people. I recently attended a conference held with this year’s World Interaction Design Day (25 Sep 2018). The theme for this year’s event was ‘Diversity and Inclusion in Design’. Below, I summarise the presentations by three presenters. “For most people technology makes things easier. For people with disabilities, however, technology makes things possible. A user persona is a tool to understand and empathise for an identifiable user. By identifying individuals, designers could make design decisions that match the primary user rather than trying to design for a broader audience. While personas promote user-centered design, it considers the best form and function for only a group of people. It looks for averages and patterns, and as a result, this means that individuals with disabilities are often left out. We need to adopt tools that reintroduce diversity back into our design process. Inclusive design, or universal design, is a design method that considers the needs and abilities of as many people as possible. Instead of a hypothetical user persona, inclusive design seeks to please a diverse range of individuals to create a common, shared experience. An inclusive design does not cater to a particular group. It includes everyone with particular preferences and situations. Designs used only by the disabled isn’t inclusive design since it excludes the able-bodied person. They are assistive technology. 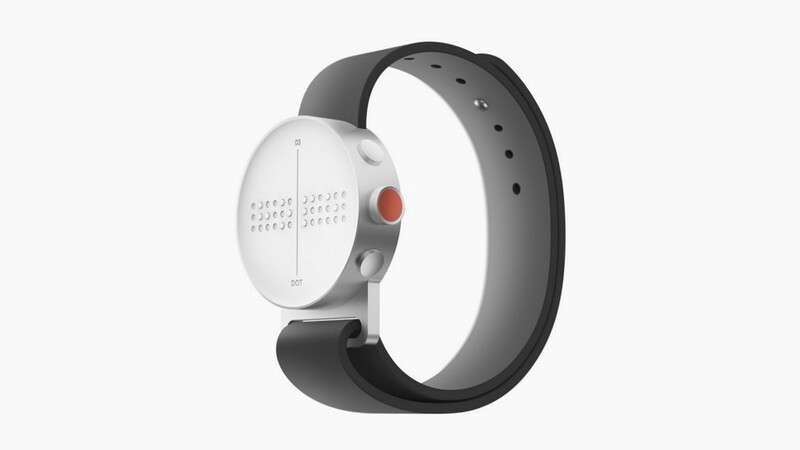 For example, the Dot Braille Watch tells the date and time for the visually impaired. While it may be a beautiful timepiece, it does not tell the time to users who cannot understand braille. The two groups of users do not have a common, shared experience when using the Dot Watch. In comparison, the new Apple Watch Series 4 includes a feature that calls the emergency services when a person remains immobile after a fall. Such an incident can happen to anyone but can be useful for the elderly or the disabled. Assistive technology need not be expensive, complex, or complicated; a simple paper and pen can help a person to communicate with others. Although straws may be harmful to the environment, it helps those who cannot bend their necks to consume liquid easily. In digital products, audio allows the blind to understand content on a website. Considering content in terms of speech not only helps a listener but can also give structure to a piece of content. Disability affects not only the one who is disabled but also those around him/her. While designing for the disabled, their support system, including their family and friends, needs to be included. They may be the ones assisting the disabled in doing a task or caring for one. Good design and technology empower people, likewise, bad design and technology (or the lack of) make one feel disabled. For example, a building that can only be accessed by staircases is inaccessible to a person on a wheelchair, hence making them feel disabled. By providing ramps, a person on a wheelchair can navigate the building with ease. These ramps may help the elderly move up the staircases easily. This is also true in digital spaces. A good website with a well-planned information architecture allows a user to navigate the website easily. In contrast, a person may be helpless when they cannot find the right information on a website with confusing navigational labels. Adopting good design practices, such as using colour contrast and larger text sizes, not only helps a person with poor vision but also improves legibility. Our decision to accommodate the physical or digital environment for the Disabled creates a better user experience for all users. By solving the problems for one user, it extends its benefits to many. 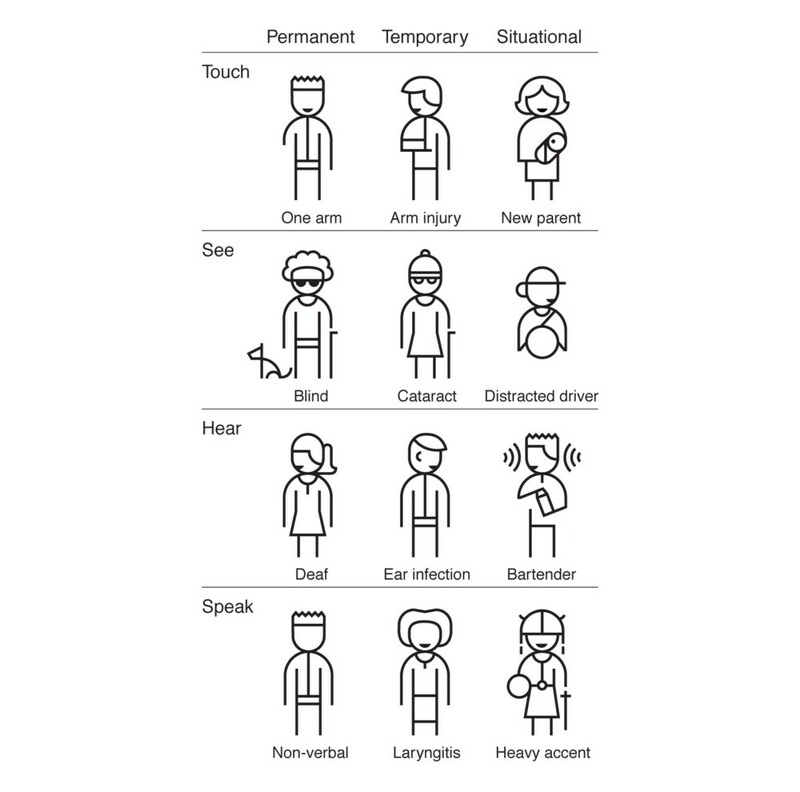 Inclusive design should consider permanent, temporarily, and situational disability. Permanent disability refers to the inability to perform a task in a particular environment due to a permanent health condition. Temporary disability refers to the inability to do an activity during a short-term injury, or an operation. Situational disability describes a specific scenario or environment where a person may not use his/her body or senses for an activity. For example, during night time, a person may have reduced vision due to night blindness. Considering different disability helps us generate new ideas and inclusive designs. By designing for someone with a permanent disability, it will benefit those with a temporary or situational disability. What is an essential feature for a permanently disabled, may be a good-to-have for everyone. For example, a device designed for a person with one arm could be used by a person with an arm in a cast. As designers, we often use our own abilities as a baseline to create solutions. The result may be useful to some but may be difficult for many. It may be difficult to imagine how a disabled person does certain tasks such as using an ATM when others do it easily. A blind cannot see how much money he/she has or how much money they are withdrawing; a wheelchair user cannot use the ATM that is positioned too high since it is normally used while standing. Through co-designing and user research, a designer can collaborate with the disabled to come out with a solution that works for them. ATMs should come with a headphone outlet to attach an earpiece so that a blind user can use the machine discreetly. It can also be designed lower with space below for a wheelchair user to move closer to the machine. In both scenarios, the ‘average’ user experience is not affected but is significantly improved for the disabled. Many of the disabled cannot take part in both the physical and digital aspects of society. Through co-designing, we invite and involve them in creating a solution while learning and understanding from their perspective. As our decisions impact those we design for, our responsibility as designers is to know how our designs affect human interactions. When we design based on our own abilities as a baseline, we exclude many in our design. But if we were to seek the perspective of others and change our mindset, the result is a more inclusive design. 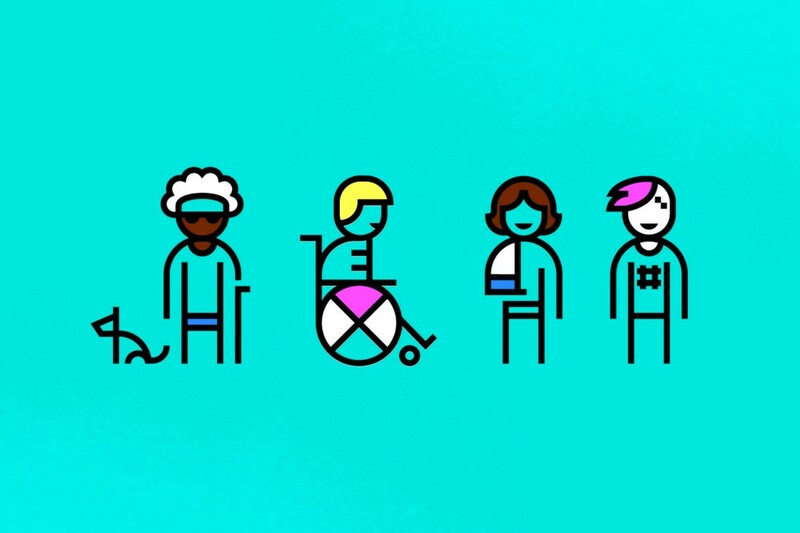 Inclusive design is more than just the physical or digital products that people use. It is a shift in mindset, methods, and behaviour. What we design is a byproduct of how we design.With inclusive design, we strive to create a world that makes lives better.